As mentioned in this post, this class is going through My First Piano Adventures (MFPA). Last week, the students learned the Stone on the Mountain chant and worked on maintaining correct piano hand posture. Large pom-poms were used as imaginary "stones". After each student successfully learned and correctly played through The Name Game, they held their "stones" while they played through it again to develop a sense of what correct piano hand posture should feel like while playing. 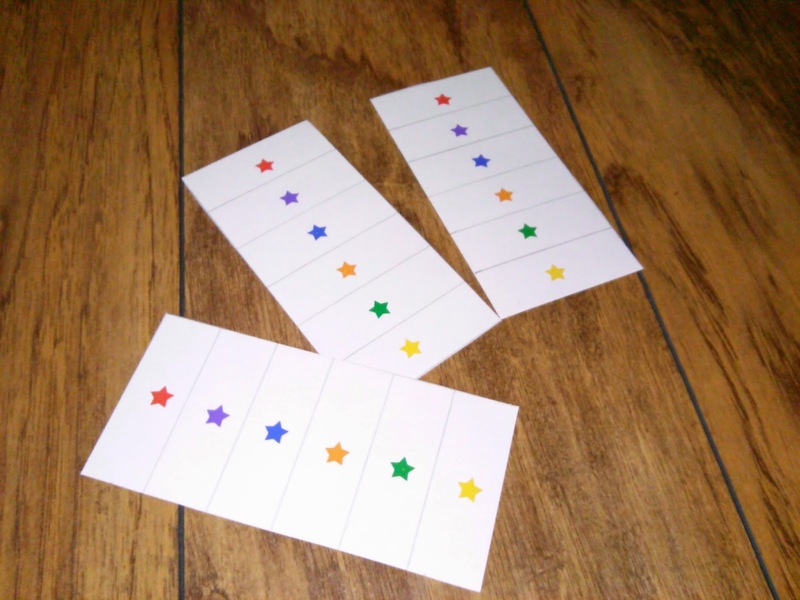 The students will review this concept in the next session with a simple game where they will play the piano while balancing erasers on the backs of their hands. This week, the students will recognize and identify the black key patterns on the piano and use cards to recreate a keyboard. The cards came from colorinmypiano.com's excellent printables list. 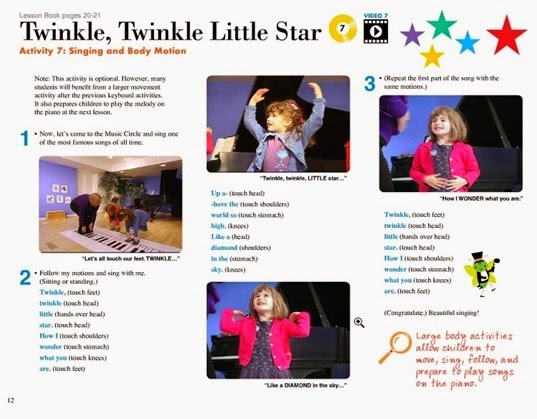 (Joy creates wonderful resources for piano teachers; I highly recommend a visit to her site!) Since this class is new to piano, they will use the black key sorting cards without the letter names. The charts will be propped on the piano as a guide for the first few weeks and colors will slowly be removed until the students no longer need them. The MFPA notation of this piece is simple to look at, effectively demonstrates the contour of the melody, and is color-coded to make it more accessible to younger students; but, it is not notated music. Although these students are young, it is very important that they become accustomed to seeing musical notation from the beginning of their training. I notated the piece using the same color code in the MFPA lesson book and added the stars to further assist the student in sight reading. I have used this successfully with other young students. The tune is a familiar one to young students and their confidence grows stronger when they are finally able to play a "real" song on the piano. I created a pdf of this notation that I can easily print out; each student will have a copy to take home to practice. On an unrelated note (no pun intended), I like to begin my classes and private lessons with this Pre-Flight Checklist for Piano Students. 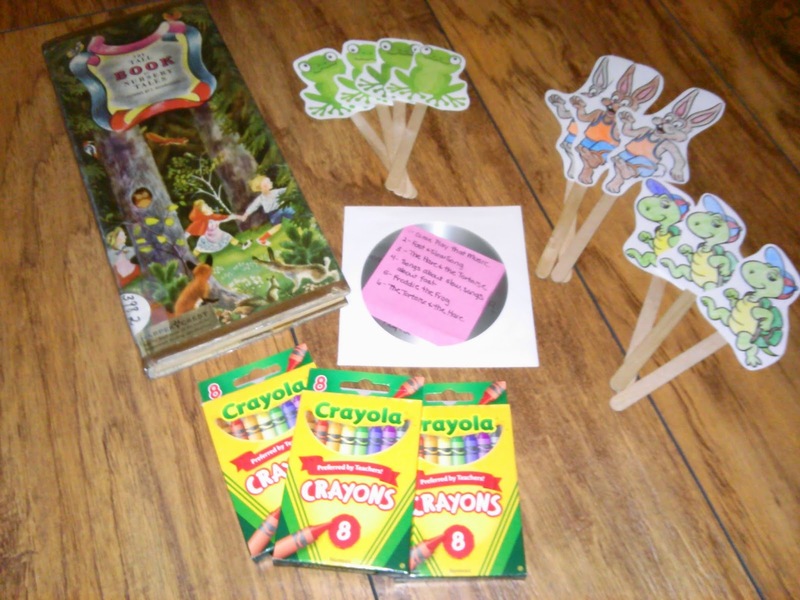 Laura Lowe created this fun and effective tool for preparing and engaging students to play the piano, and has several insights on her site. Please follow the link for further reading! The focus of this week's lesson is tempo. Andante and allegro; slow and fast. Since the class is comprised of 1-3 year old students, I like to keep the activities upbeat and short and reinforce the concepts by verbally using the musical terms. This week, we will begin with some songs that feature fast and slow by Margie La Bella and Jack Hartmann. We will also sing and move to Dr. Jean's Banana Dance. To further explore body percussion and rhythm, we are going to listen to The Hare and the Tortoise and follow visual body percussion cues in time with the music. This will be followed by an adaptation of this fun game that I found on Pinterest! Instead of having the students independently create their own rhythms, I will introduce a rhythm and have them echo it. (I do plan to use this game in its original form with older students, too, and perhaps even the with the church choir that I direct! Sssh! Don't tell them!) The body percussion and rhythm segment will conclude with Der Glumph Went the Little Green Frog, using these adorable frog stick puppets to rhythmically "glumph"! And one named Slow (say lines with Slow slowly). Now, help me count them. Wiggle them up and down. 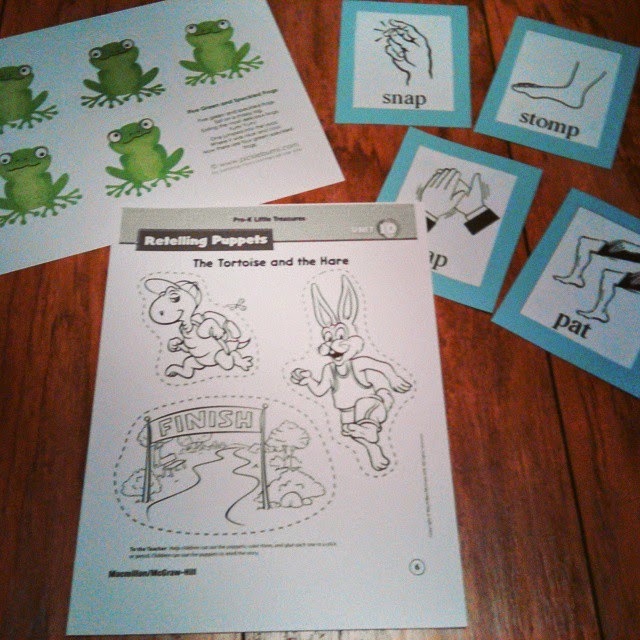 The concepts of fast and slow will be further stressed in various instrumental, movement, and game activitie and in a story time reading of Aesop's fable, The Tortoise and the Hare. I found a beautiful rendition of this classic tale by Stephen Simon, performed by the London Philharmonic Symphony, that the students will listen to while completing topic-related coloring pages. These lessons are amazing! 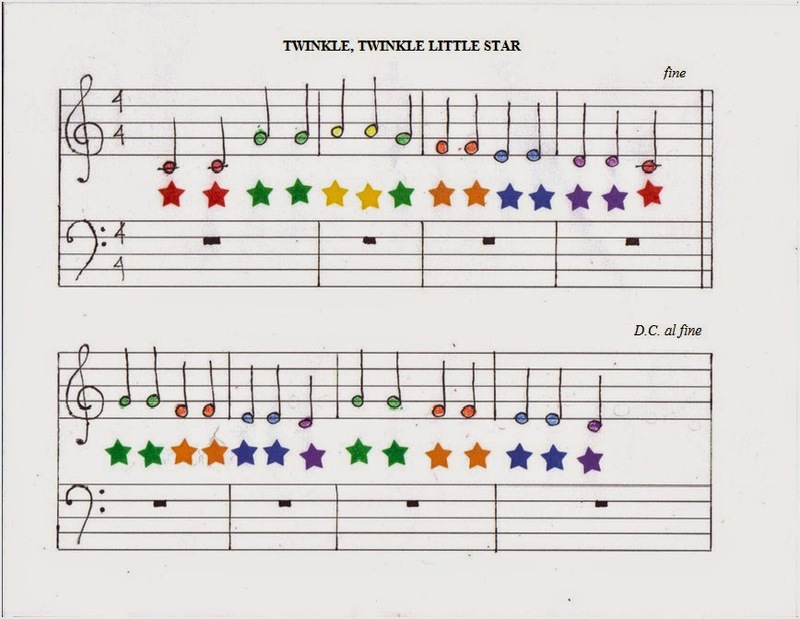 I use the colored star version to teach "Twinkle Twinkle" as well. I give the students a set of matching pom poms, and then I take colors away until they have it memorized. I love your little star chart idea too! The kids are going to have a great week! Thank you! I really like the idea of pom-poms. I'm going to have to try that, too. It sounds like a fun way to challenge them! The star charts have worked well with the private students who regularly practice. They take them home for practice and usually have it memorized by the next lesson.